We produce fabrics in many materials and can help source and formulate yarns to weave for your own specifications. These are some of our most popular ranges. The bulk of our production is in pure new wool, which we create in various qualities. These range in weight from a very robust Regimental twill, down to a featherweight plain weave. They can be produced in small to medium volumes on our traditional shuttle looms for a clean 'natural' selvedge where that is required, or on faster modern looms for large volumes. Our Pure Spun Silk is very different to the more commonplace Dupion silk. Purified of all slubs, our finest silk yarn produces a lusciously smooth fabric that with a sumptuous feel that is never forgotten. 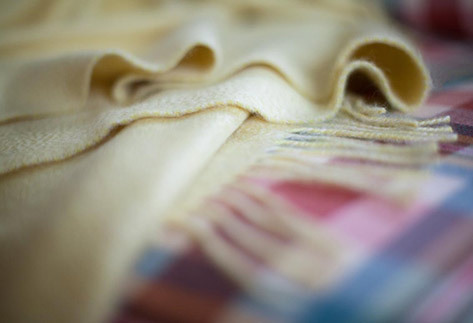 We produce silk mostly in a dense twill weave suitable for accessories, linings, and occasional soft furnishings, and also in a gossamer weight plain weave. After over a year of development to produce a lambswool we're proud to put our name to, we're delighted to add the latest fabric quality to our range. Our soft and fluffy lambswool is ideal for scarves and blankets, giving much of the warmth and comfort of cashmere at much lower cost. You'll be pleasantly surprised by how few items you need for your own exclusive design in any tartan. Scotland is renowed for producing the world's finest cashmeres, and ours is no exception. We specialise of course in traditional tartans and signature plaids, but can also produce stripes or plain colours to complement any interior scheme. Surprisingly, the cashmere pictured is not in fact plain, but uses an extremely subtle plaid, in an effect that lifts it above the ordinary.